Most of us would have played the game of snake and ladder or atleast we would have watched people play the game. It can sometimes be a really annoying game as it seems to never end, but on the other hand, it’s a game where one cannot predict anything; anyone can be on top and within the next move can land down. 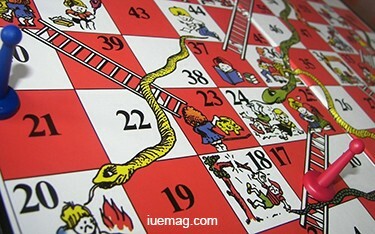 It is so relevant to each one of our lives, it is not wrong if we compare our life to the game of snake and ladder. In our lives, there are times where we might come across the most difficult situations, situations which hurt us, test us, put us down, and criticize us. But one should remember that even if every difficulty puts us down that’s not the end, there is definite slow and steady progress. Just as the game continues, even if you are bitten by snake and land down, still in the next move, you move ahead and rise up. Life also gives us loads of ladders to climb, the problem with most of us is we quit the game in between just because we are bitten by the snake and land down, which is definitely not the right thing to do, remember whatever ups and downs and pits you come across - there are always ladders which are kept for us by God. The most important factor is the person who throws the dice, need not be worried because god has planned our every move, he has blessed us and given us so many ladders so that even if we stumble and fall, we can get up and move ahead. Finally all of us should never forget that like in the game of snake and ladder there is no 1st, 2nd and 3rd. It’s all about completing the game and reaching the finishing line. It is not surprising that all complete the game. Some might complete quickly and easily and few others may have to stumble loads of snakes and then reach destination, but at the end, all of them reach the final destination. Next time when life throws challenges at you, remember it's just a snake - it will pass, and we will reach our destination, let us learn not to give up, fight justly, try our level best put in efforts and reach our goal. Any facts, figures or references stated here are made by the author & don't reflect the endorsement of iU at all times unless otherwise drafted by official staff at iU. This article was first published here on 4th July 2016.